Whether to renovate before selling is a common question posed by home owners in New York City. 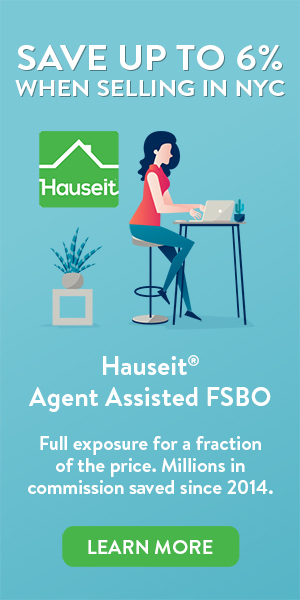 So should you sell a home as is? Or is it worth it to renovate before selling in NYC? You should always try to sell a home as is because it is very difficult to get a positive return on investment from renovation costs. With that said, it is advisable to take care of small cosmetic problems such as chipped or peeling paint, broken light bulbs, and scratches on cabinets. These type of issues can be easily and inexpensively solved either by yourself, your superintendent or a local handyman. Small fixes such as this which can give your home the appearance of being relatively new and move-in ready could increase your sale price well in excess of the time and resources spent. However, it’s important to understand that major renovations such as a replacement or re-do of an entire kitchen are highly inadvisable. It will be hard to gauge whether buyers will appreciate the work you’ve done, and rarely will you be able to recoup your renovation costs through the buyer paying a higher purchase price. This piece of advice is especially important in a market like Manhattan where everything is expensive, especially the cost of labor and materials when it comes to renovating a home. Unless you are an experienced General Contractor yourself with lots of connections to low cost suppliers and inexpensive labor, you’ll most likely get your face ripped off and have no chance of recouping the massive expense when selling. Furthermore, it’s truly unnecessary for the most part to have to upgrade your apartment before selling in a hot market like New York City. The pool of buyers is so deep in NYC that you will get plenty of buyers who will see past any potential renovations they’ll have to make themselves. This will be especially true if you price it appropriately lower versus a comparable, renovated unit. In the NYC market, it won’t just be contractors and fixer uppers who will be interested in a unit that needs renovation but is being sold as is. There will be plenty of first time home buyers and families who will be equally interested due to the severe lack of affordable housing in the city. What If You Want to Renovate Before Selling in NYC Anyway? 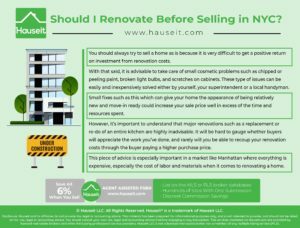 If you’re set on making renovations anyway even though you might not be able to recoup the expense when you sell, here are a few tips to maximize your investment in the New York City market. If you can add an additional legal bedroom or bathroom without much hassle and without incurring an awkward configuration, you will dramatically increase your buyer base and sale price potential. Even an additional room that is a home office that can double as a baby’s room will bring a whole raft of new buyers to your listing. Converting a 1 bedroom into a 2 bedroom apartment listing will bring a whole new segment of buyers to your property. That’s because many buyers will filter for only listings that have at least a certain number of bedrooms. Therefore, the more bedrooms and bathrooms you have, the better! If you have a loft with very high ceilings, consider adding storage space on a mezzanine level to increase value. If you have an enclosed kitchen, consider knocking down some non-structural walls to create an open kitchen layout which will make your home appear bigger. A washer and dryer machine is a coveted amenity that many buyers, especially families, look for and will screen for. Therefore, try to install a washer and dryer machine if your building allows it. Even the existence of a washer and dryer machine hookup without the actual appliances will increase the value of your apartment. Most kitchens these days have dishwashers; however, consider adding one if your kitchen does not as it is a fairly standard amenity these days. The same goes for an oven. Note: Please do not underestimate how useful an amenity a washer/dryer is. Most neighborhood laundromats are notorious for tearing clothes and ruining dedicates. If you don’t have a washer/dryer in your apartment, you’ll either have to hand wash clothes or bring it to a friend who has a washer/dryer in their apartment. A fresh coat of paint will go a long way to making your apartment appear new and unlived in. You should especially consider doing this if you have cracks in your paint or peeling paint. The color of the paint you choose is a personal preference, though many prefer a simple coat of white paint to offer buyers a blank canvas to imagine what their new home will be like. An additional advantage of white paint is that it may reflect more light than other hues and thus may help the buyer feel that the home is bigger than it is. You don’t have to replace that crystal chandelier you have in your hallway, but sometimes it makes sense to make simple updates like replacing cool, white lightbulbs with lightbulbs that are either tinted or emit a warmer glow. There is no need to go crazy and lower your ceiling so you can install the latest recessed lighting. Sometimes all it takes is to put a cover on an exposed lightbulb, or to replace it with one that emits a softer glow. 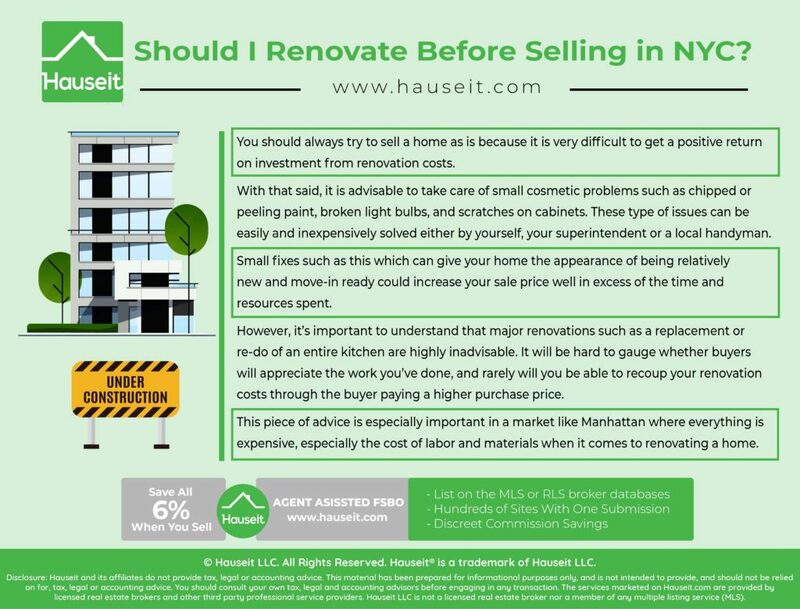 If you wish to renovate before selling in NYC, then the two investments you can make that will give you the best chance of recouping your expense is to upgrade the kitchen and the bathroom. You don’t necessarily have to gut renovate the entire kitchen. Sometimes a new countertop, appliances or a sophisticated backlight under the kitchen cabinetry will more than do the trick. Don’t go crazy with customization. Since you’re renovating to resell, it’s okay to purchase cabinetry and even appliances from IKEA. Needless to say, try to choose popular colors and materials that will have widespread appeal. If you don’t want to replace the cabinetry, you can even consider just replacing the cabinetry doors or painting them. Be very careful about which color you choose to repaint the cabinetry with, it should be appealing to a wide swath of buyers and should not look cheaply done. Just like the kitchen, the bathroom is a part of the home you should seriously consider renovating before selling in NYC. It is one of the rare renovations where you just might be able to recoup your expense by selling for a higher price. If you have old or otherwise unattractive tiles on your bathroom floor, you could consider laying new, sleek, modern tiles on top of them versus digging out the old ones. Similarly, if you have older bathroom wall tiles, you could consider glazing them over rather than ripping them out and replacing them. Sometimes, a simple deep scrubbing and cleaning session will do the trick.